Just found this on Imgur.com under current events. 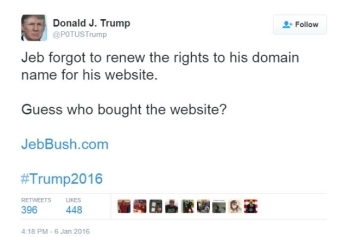 According to this post, evidently Jeb Bush, or most likely one of his staffers, let the domain JebBush.com expire and now redirects to DonaldJTrump.com. You can say a lot of things about Trump, but at least he understands the value of domain names and how to manage them. How does Jeb's management let this happen at such a critical time? Running and maintaining technology should be a litmus test for running the country. Another candidate can't seem to manage an email account, yet she feels qualified to run as president. Not to mention the one we've got paid over 600 million for Healthcare.gov. Trump just elevated his traffic level and owned Jeb, literally.